Pat Metheny. Photo credit: Flickr user Steevithak/ Creative Commons licensed. The next show will air on Sunday December 15, 2013 from 11:00 PM – 1:00 AM Monday Eastern Standard Time on WBAI, 99.5 FM in the NYC metro area or streaming online at wbai.org. This installment of the program will feature an encore presentation of a 2010 interview with the incredibly versatile guitarist, composer, and bandleader Pat Metheny. It’s a fund drive special, so we’ll be offering the interview and one of Metheny’s CDs as as thanks for a pledge to the station. Pat Metheny was born in Kansas City on August 12, 1954 into a musical family. Starting on trumpet at the age of 8, Metheny switched to guitar at age 12. By the age of 15, he was working regularly with the best jazz musicians in Kansas City, receiving valuable on-the-bandstand experience at an unusually young age. Metheny first burst onto the international jazz scene in 1974. Over the course of his three-year stint with vibraphone great Gary Burton, the young Missouri native already displayed his soon-to-become trademarked playing style, which blended the loose and flexible articulation customarily reserved for horn players with an advanced rhythmic and harmonic sensibility – a way of playing and improvising that was modern in conception but grounded deeply in the jazz tradition of melody, swing, and the blues. With the release of his first album, Bright Size Life (1975), he reinvented the traditional “jazz guitar” sound for a new generation of players. Throughout his career, Metheny has continued to re-define the genre by utilizing new technology and constantly working to evolve the improvisational and sonic potential of his instrument. Metheny joined us via telephone for an hourlong wide-ranging interview before a rare week-long stint at New York’s Blue Note with bassist Larry Grenadier. Metheny talks about his use of electronics in music, the art of improvisation, his innovative Orchestrion releases and tours, his stint teaching at the prestigious Berklee College of Music as a teenager, and much more. We’ll play excerpts of the interview and music from the entire spectrum of his incredibly prolific career. Please join us and help keep this listener-supported experiment alive. WBAI. Donate to WBAI or pledge for the CD set if you can, but be sure to join us for Suga’ in My Bowl’s latest musical trip! See the full track list and info on What’s it All About on Allmusic. Engineered and Produced by Joyce Jones. Hosted by Arts Producers Joyce Jones and Hank Williams. Watch Metheny play a solo version of “Into the Dream” with the Pikasso 42 string guitar. In memory of the recently deceased guitar great Jim Hall, watch them perform together live with (former Suga’ guest) bassist Christian McBride. The next show will air at a special time: Monday October 10 from 10:00pm – Midnight Eastern Standard Time on WBAI, 99.5 FM in the NYC area or streaming online at wbai.org and will feature an interview with the incredibly versatile guitarist Pat Metheny. Pat Metheny was born in Kansas City on August 12, 1954 into a musical family. Starting on trumpet at the age of 8, Metheny switched to guitar at age 12. By the age of 15, he was working regularly with the best jazz musicians in Kansas City, receiving valuable on-the-bandstand experience at an unusually young age. Metheny first burst onto the international jazz scene in 1974. Over the course of his three-year stint with vibraphon…e great Gary Burton, the young Missouri native already displayed his soon-to-become trademarked playing style, which blended the loose and flexible articulation customarily reserved for horn players with an advanced rhythmic and harmonic sensibility – a way of playing and improvising that was modern in conception but grounded deeply in the jazz tradition of melody, swing, and the blues. With the release of his first album, Bright Size Life (1975), he reinvented the traditional “jazz guitar” sound for a new generation of players. Throughout his career, Pat Metheny has continued to re-define the genre by utilizing new technology and constantly working to evolve the improvisational and sonic potential of his instrument. 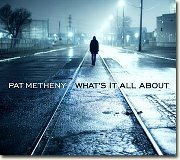 During this membership/fund drive special, we will feature a discussion with Pat and share cuts from his latest release “What’s It All About.” Please join us and help keep this listener-supported experiment alive. Hosted by Arts Producers Joyce Jones and Hank Williams.